"Nutrition label". Licensed under Public Domain via Wikimedia Commons. Let’s face it: sometimes nutrition can seem like a pretty complicated topic. If you feel like you’re being told to avoid a certain nutrient one day, and then to cut out an entire food group the next, don’t worry: you’re not the only one whose head feels like it’s spinning. Diet trends tend to create a whirlwind of nutrition misinformation and myths, but for the most part, basic nutrition is pretty straight-forward, and understanding the main elements can help you to more easily make healthier food choices. There are three main macro-nutrients: carbohydrates, protein and fat. Protein and carbs contain four calories per gram and fat contains nine calories per gram. (This is why high-fat foods tend to have more calories, but remember fat isn’t necessarily ‘bad,’ there are simply different kinds and some are better than others). Dr. Lisa Young, Ph.D. R.D., C.D.N., a nationally recognized nutritionist and an adjunct professor in the Department of Nutrition, Food Studies and Public Health at New York University, says the first thing you should look at is the serving size and the number of servings per package (this is the first bit of information listed right under the “Nutrition Facts” heading). The serving size is the recommended portion size, or how much you should eat in one sitting. The number of servings per package is exactly that: how many one-time servings the package contains. Young says this is the most important thing to consider because ignoring it makes it very easy to be misled by the actual number of calories in certain foods. “People think whatever amount they eat pertains to the calorie and nutrient info on the label,” she explained. For example, if a label says the food has 100 calories, that information pertains to one serving, so if that package contains four servings and you were to eat the whole thing without considering the serving size, you would actually be eating 400 calories without really realizing it. The Takeaway: Remember that the numerical values (calories, grams of fat, carbs protein, etc.) pertain to one serving size and not the entire package of food. 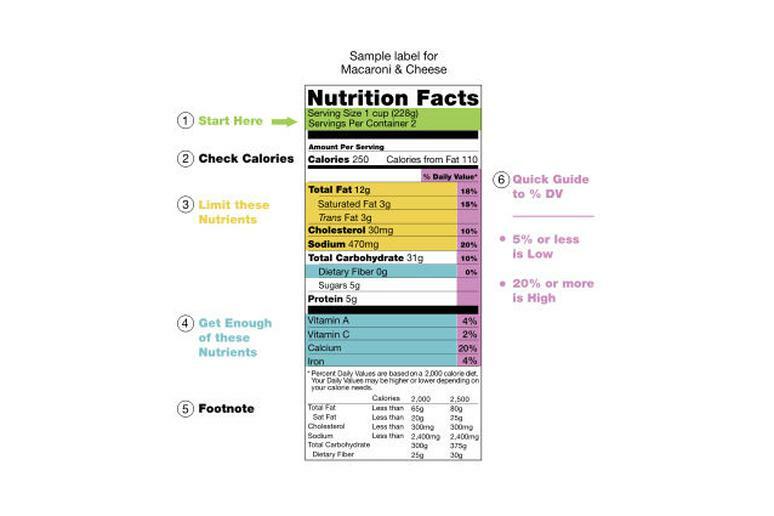 Young advises that you especially steer clear of long ingredient lists (which are listed separate from the “Nutrition Facts” but usually somewhere close by on the package). The idea is to keep the foods you eat as close to nature as possible, so be on the lookout for ingredients that you’ve never heard of or that sound questionable. For example, when choosing a peanut butter, look for a brand that’s made with just peanuts instead of one that adds ingredients like sugar and hydrogenated oils. And speaking of sugar: also keep an eye out for foods with high added sugar content. For example, foods like milk and non-sweetened juices have naturally occurring sugars, but others like cereal, granola, soda and yogurt may be sweetened with unnecessary amounts of extra sugar. For reference, the American Heart Association’s recommends that men consume no more than 37.5 grams of added sugar per day and women no more than 25 grams per day. As of yet, labels don’t make this distinction so it’s important to read the ingredient list. Young definitely suggests avoiding corn syrup, sucrose, sugar and molasses. And for cereals, she said, the amount of sugar should be less than the number of grams of fiber (which should be listed directly below the carbohydrates and just above the sugar). Young also suggests avoiding artificial sweeteners, noting that they do not help us lose weight. Some studies have even shown that they may contribute to weight gain. Additionally, make sure to skip any foods that include partially hydrogenated vegetable oil (aka trans fat) in their ingredient lists. Young said stick to mostly whole foods (like fresh produce, which doesn't require any nutrition labels) and for packaged foods stick to items that have short ingredient lists with items that you can pronounce and understand. What Matters More for Weight Loss, Food Quality or Quantity?